Taking Time for Mommy: Winnemucca Release Day Blitz - 5 copies up for Grabs! 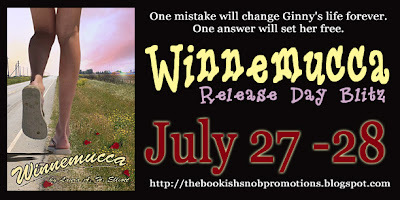 Winnemucca Release Day Blitz - 5 copies up for Grabs! Winnemucca is a young-adult small-town fairy tale about a teenage girl's enchanted road trip to her true self no matter who or what tries to stop her. This is a digitally signed edition by the author with a 70 cent donation to The Wounded Warrior Project.One mistake will change Ginny’s life forever. One answer will set her free. Once upon a time Ginny’s road blood ripened, the day she got wise to love. Engaged to the high school quarterback, his quarter-carat ring and enchanting smile should have been enough for her. But, she stands him up and takes a walk where every step questions her happily ever after gone-bad and the fate of the mother she never knew. The mother her father refuses to talk about. Ginny fights to untangle her big, fat, lie-of-a-life on an enchanted road trip to Winnemucca, where she believes all her answers lie. She must solve the riddle of her past and outrun everyone who wants a piece of her future, including a man determined to see she never has one. When fear’s as blind as love, how far would you go to find the flesh-and-blood reality of your own happily ever after?